Querência, in Mato Grosso, BrazilA new article in Environmental Research Letters “Statistical confirmation of indirect land use change in the Brazilian Amazon," looks at how mechanized agriculture in Brazil affects the country's forest in the Amazon, which is the second largest forest in the world. The article is authored by Marcelus Caldas, an assistant professor of geography at K-State, and colleagues Eugenio Arima from the University of Texas at Austin, and Peter Richards and Robert Walker from Michigan State University. Using data from 2003-2008, the team statistically linked the loss of forest area as the indirect effect of changing pastureland into space for soybean and biofuel crops in counties bordering the Amazon. Marcelus Caldas, an assistant professor of geography at K-State says: "Between 2003-2008 soy production expanded in Brazil by 39,000 square kilometers. Of this 39,000 square kilometers, our study shows that reducing soybean production by 10 percent in these pasture areas could decrease deforestation in heavily forested counties of the Brazilian Amazon by almost 26,000 square kilometers -- or 40 percent." The Brazilian government says soybean and sugarcane are grown largely in degraded pasture, but data from the team's spatial analysis work cascading impacts: many of these crops have crept into the Brazilian savanna, a large area bordering the Amazon that's used for cattle. Consequently, this has created deforestation in the savanna, driving cattle inside the Amazon. "Our data shows that the Amazon now has 79 million heads of cattle," Caldas said. "Fifteen years ago, it had less than 10 million. That means that there's a problem with cattle moving inside the forest." This could be exacerbated with increased global demand for food crops in Brazil. The tradeoffs between food, fuel and forest could continue to come down on the side of food and fuel, at the expense of forests. More here. Official press release here. 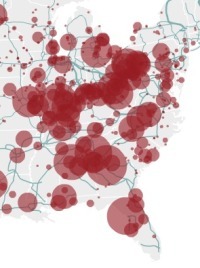 19th & 20th century power: coal plants in the eastern US with existing power gridFrom NPR: these new maps showing the US energy grid, a "complex network of independently owned and operated power plants and transmission lines. Aging infrastructure, combined with a rise in domestic electricity consumption, has forced experts to critically examine the status and health of the nation's electrical systems." This site has maps of existing power sources (coal, nuclear, gas, hydro and oil), and potential for new alternatives (wind and solar - no bio). What new infrastructure will be needed to bring wind and solar power from high production areas to the rest of the country? Today's NPR story by Richard Harris and related article by Tim Searchinger et al. highlight exactly the concerns with global biofuel production that prompted us to put in our grant (with Norm Miller and Dave Sunding) to BP and EBI on campus. What are the social, economic and environmental tradeoffs associated with widespread biofuel growth? How can we plan to spatially optimize use of landscapes so that increased carbon emissions do not result? Anyway, cool stuff. Starting a thread about global data for potential biofuels mapping that LBL is involved in with BP. In a nutshell, we have to ensure we understand biofuel / crop / natural forest tradeoffs that will undoubtedly be forced with the new enthusiasm for biofuels globally. Spatial decision support can help here. From SEDAC.